It is so difficult to find fun, entertaining, yet uplifting books for tween boys! I have struggled to find books for them to enjoy. The Christian market is getting better at ministering to boys and I am so thankful. Bill Myers has been an author we have read many times, and he has a knack for the adventure side that boys love. 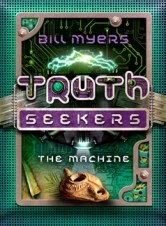 In Billy Myers Truth Seekers The Machine, we the Mackenzie twins Jennifer and Jake who take turns narrating the story. Their mother has unexpectedly died.. leaving the twins in the care of a dad they barely know, moving from California to Israel. I do wish there were more novels where the parents can be together and happy! The family bonds together as they explore Israel and uncover powerful historical scenes of the Bible. They have created a machine that will play holographic images of times past. How cool to see images from Noah and Moses time. Very engaging story, full of great Biblical truths! Geared for ages 8-14.